Interseeding cover crops to corn at the V4 stage has been met with mixed success, likely because of shading by the tall corn canopy later in the season hindering cover crop growth. Cooperators evaluated the effect of planting corn in 30- and 60-in. row-widths on corn yield and biomass production by cover crops interseeded to corn in early June. Compared to 30-in. row-widths, corn planted in 60-in. row-widths resulted in equivalent yields at two farms and reduced yields at the two other farms. Cover crops interseeded to corn planted in 60-in. row-widths produced more biomass at two of three farms. While corn is most-often planted in 30-in. row-widths in the Upper Midwest, interest in alternative planting arrangements remains. One such arrangement is the solar corridor crop system. As defined by researchers in Missouri: “The solar corridor crop system is designed for improved crop productivity based on highly efficient use of solar radiation by integrating row crops with drilled or solid seeded crops in broad strips (corridors) that also facilitate establishment of cover crops for year-round soil cover” (Kremer and Deichman, 2014). One variation of the solar corridor crop system is that of strip intercropping corn, soybean and oats. Using this system, PFI cooperators saw improved corn yields in on-farm research conducted in the 1990s. 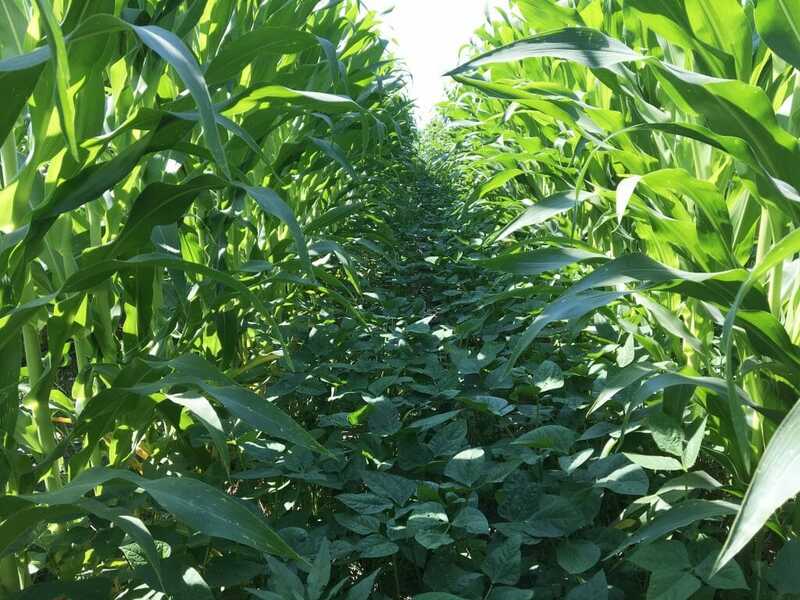 The improved yields were a result of increased solar capture by the corn in the border rows of six-row strips that were adjacent to 15-ft-wide strips of soybeans and oats – crops that do not grow nearly as tall as corn. Strips of corn planted in 30- and 60-in. row-widths at Jack Boyer’s on June 27, 2018. Corn was planted on May 6 and cowpeas were interseeded to corn on June 8. Another variation of the solar corridor crop system involves planting corn in wider rows. This system particularly appeals to farmers who have been trying to interseed cover crops to corn at the V4 stage. Seeding at this stage (early June) presents opportunities for an abundance of cover crop species like cowpeas, sunn hemp, radish, buckwheat and many others that cannot be seeded in the fall in Iowa. A wider corn row might increase the chances of successful interseeding by permitting more sunlight to the cover crops seeded in the interrows. PFI cooperator Jack Boyer has had success interseeding cover crops to seed corn (Gailans and Boyer, 2016) but has seen mixed results when interseeding into field corn (Gailans and Boyer, 2015; Gailans et al., 2017). He concluded that interseeded cover crop success owed to the seed corn permitting more sunlight to the interrow than field corn. With the potential to grow more cover crop biomass in wide corn rows, the farmers conducting the present study cited opportunities for fall grazing and N contributions to the soil from warm-season legume cover crops as their motivation for investigating corn planted in 30-in. and 60-in. row-widths. Objective: Determine if corn planted in 60-in. row-widths can 1) maintain grain yields similar to corn planted in 30-in. row-widths and 2) better accommodate a cover crop interseeded to the corn in early summer. This study was conducted by Fred Abels near Holland in Grundy County; Jack Boyer near Reinbeck in Tama County; Brian & Heather Kessel and Jim Johnson near Lamoni in Decatur County; and Chris Teachout near Shenandoah in Fremont County. Abels, Boyer and Kessel/Johnson planted randomized and replicated strips of corn in 30- and 60-in. row-widths and then interseeded cover crops to all strips in early summer. Boyer seeded the corn in 60-in. rows in twin-rows. Teachout also planted randomized and replicated strips of corn in 30- and 60-in. row-widths, but he also included a subplot factor: half of each strip was interseeded with cover crops in early summer and the other half of the strip was left with no cover crop. Corn and cover crop management at all farms is provided in Table 1. Boyer and Teachout collected soil samples from each strip in mid-June. 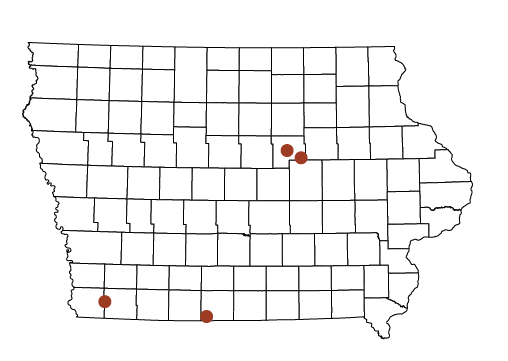 Samples were sent to AgSource Laboratories (Ellsworth, Iowa) to determine the burst of CO₂-C following rewetting of dried soil using the Solvita assay. Abels, Boyer and Kessel/Johnson assessed aboveground cover crop biomass near corn harvest by clipping shoot material from quadrats (one ft x one ft) placed in each strip. Samples were sent to Midwest Laboratories (Omaha, Neb.) to determine dry weight and N concentration. All cooperators harvested corn individually from each strip. Yields were corrected to 15.5% moisture. Data were analyzed using JMP Pro 13 (SAS Institute Inc., Cary, NC) statistical software. Means separations are reported using Tukey’s Least Significant Difference (LSD). Statistical significance was determined at the 95% confidence level. Compared to corn planted in 30-in. row-widths, corn planted in 60-in. 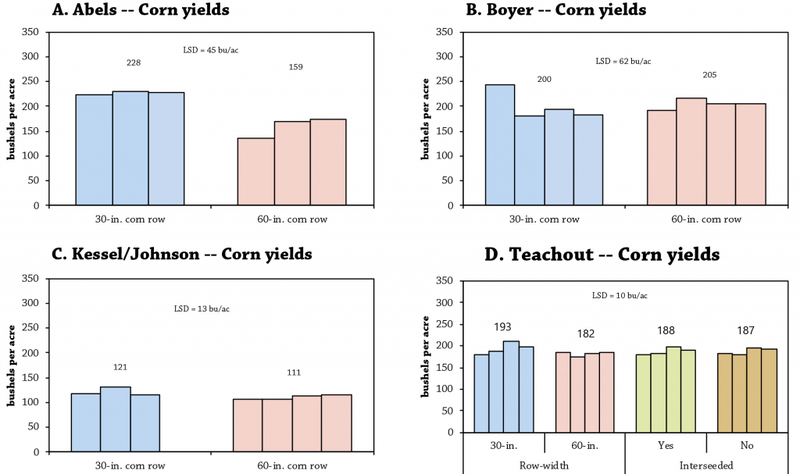 row-widths had no effect on yield at the Boyer and Kessel/Johnson farms but resulted in 30% lower yields at Abels’s and 6% lower yields at Teachout’s (Figure 1). Interseeding cover crops at the V4 stage did not have an effect on corn yield at Teachout’s regardless of row-width. Corn in 60-in. row-widths at Abels’s and corn in both row-widths at Kessel/Johnson’s yielded well below their respective five-year county averages of 196 bu/ac and 160 bu/ac (USDA-NASS, 2019). “I have a striped gopher problem that really affected the corn in the 60-in. row-widths,” Abels said of the low yields. “I think they went right down the row eating the kernels out of the ground.” At Boyer’s and Teachout’s, corn yields were similar to or exceeded their respective five-year county averages of 192 bu/ac and 183 bu/ac (USDA-NASS, 2019). FIGURE 1. Corn yields as affected by row-width at A) Abels, B) Boyer, and C) Kessel/Johnson and D) as affected by row-with and the presence or absence of interseeded cover crops at Teachout in 2018. Columns represent individual strip yields. Above each set of columns is the treatment mean. By farm, if the difference between the treatment means is greater than the least significant difference (LSD), the treatments are considered statistically different at the 95% confidence level. These mixed results mirror findings from research conducted at the University of Missouri. In that study, corn planted in 60-in. row-widths achieved equivalent yields to corn in 30-in. row-widths in only one of three years (Nelson, 2014). In the other two years, corn in 60-in. row-widths yielded 14–39% less than in 30-in. row-widths. Cowpea cover crop growing between corn planted in 60-in. row-width at the Kessel/Johnson location on July 12, 2018. Corn was planted on May 10 and cowpeas were interseeded to the corn on June 7. All of the cooperators noted that most of the cover crop biomass observed near harvest comprised of cowpeas. Corn row-width had no effect on interseeded cover crop biomass at Abels’s but the 60-in. row-widths resulted in nearly four times as much biomass as the 30-in. row-widths at the Kessel/Johnson location (Table 2). That extra biomass production at Kessel/Johnson’s resulted in three times as much biomass N in the 60-in. row-width treatment. Biomass samples were bulked at Boyer’s which precluded statistical analysis, but the 60-in. row-width appeared to result in much more cover crop biomass and biomass N.
Though not explicitly measured, weeds did comprise portions of the sampled cover crop biomass. 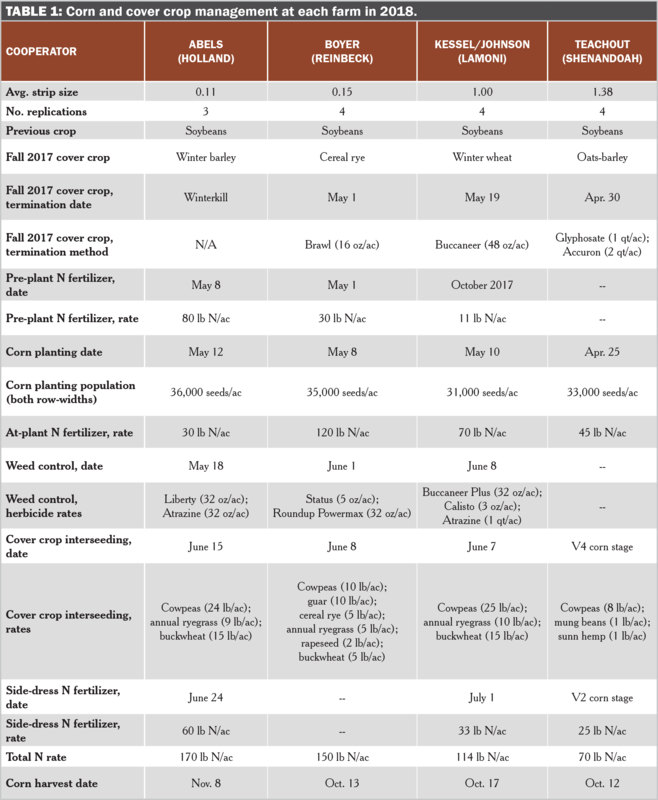 Abels, Boyer and Kessel/Johnson each noted that controlling weeds when interseeding cover crops to corn in June can present some challenges. After cover crops have emerged, spray or cultivation passes cannot occur without damaging those cover crops. While a wider corn row can better accommodate interseeded cover crops, this can also present opportunities for weeds as well. The Solvita assay determines soil microbial activity by measuring the amount of CO₂-C respired over a 24-hour period from a dried soil sample that has been rewetted and held at an ideal temperature. Neither corn row-width nor the presence or absence of an interseeded cover crop had an effect on the CO₂-C soil burst at Boyer’s and Teachout’s (Table 3). Though Boyer saw more cover crop growth with 60-in. corn row-widths (Table 2), this did not improve soil microbial activity. On the contrary, research in Missouri has provided evidence for increased soil glucosidase activity, another indicator of soil microbial activity, resulting from corn in 60-in. row-widths compared to 30-in. row-widths (Kremer and Deichman, 2014). The authors of that study attributed increased carbohydrate release to the soil from corn roots resulting from increased solar radiation capture by the corn in the wider row. This study tested the effect of corn row-width (30- vs. 60-in.) on corn yield and interseeded cover crop biomass production. The Boyer and Kessel/Johnson locations saw statistically equivalent corn yields between the two row-width treatments (Figure 1) but also observed much more biomass produced by the cover crops interseeded into the corn planted in 60-in. row-widths (Table 2). Corn yields at the Abels and Teachout farms were reduced in the 60-in. row-width treatment (Figure 1). Abels also saw no difference in the amount of biomass produced by the cover crops interseeded into corn planted in either row-width (Table 2). Soil microbial activity, as determined by the Solvita CO₂-C burst assay, was not affected by corn row-width or interseeded cover crops at Boyer’s and Teachout’s (Table 3). Cowpea cover crop growing between corn planted in 60-in. row-width (L) and 30-in. row-width (R) at Jack Boyer’s on Sept. 17, 2018. Corn was planted on May 6 and cowpeas were interseeded to corn on June 8. Thank you to Bob Recker of Cedar Valley Innovation in Waterloo, Iowa. His presentation on the topic of wide-row corn at the 2018 Practical Farmers of Iowa annual conference spurred the idea for these on-farm research trials. Gailans, S. and J. Boyer. 2015. Interseeding Cereal Rye into Corn at the V4 Stage at Jack Boyer’s in 2015. Practical Farmers of Iowa blog post. Ames, IA. http://practicalfarmers.org/blog/2015/10/29/interseeding-cereal-rye-into-corn-at-v4-stage-at-jack-boyers-in-2015/ (accessed Jan. 14, 2019). Gailans, S. and J. Boyer. 2017. Interseeding Cover Crops in Seed Corn at the V4-V6 Stage. Practical Farmers of Iowa Cooperators’ Program, Ames, IA. https://practicalfarmers.org/research/interseeding-cover-crops-in-seed-corn-at-the-v4-v6-stage/ (accessed Jan. 14, 2019). Gailans, S., J. Boyer and J. Gustafson. 2018. Corn Leaf Architecture for Interseeded Cover Crop. Practical Farmers of Iowa Cooperators’ Program, Ames, IA. https://practicalfarmers.org/research/corn-leaf-architecture-for-interseeded-cover-crop/ (accessed Jan. 14, 2019). Iowa Environmental Mesonet. 2018. Climodat Reports. Iowa State University, Ames, IA. http://mesonet.agron.iastate.edu/climodat/ (accessed Jan. 9, 2019). Kremer, R. and L. Deichman. 2014. Soil Quality and the Solar Corridor Crop System. Agron. J. 106:1853–1858. https://www.researchgate.net/profile/Robert_Kremer/publication/266141259_Soil_Quality_and_the_Solar_Corridor_Crop_System/links/5426cfc10cf26120b7b3449b/Soil-Quality-and-the-Solar-Corridor-Crop-System.pdf (accessed Jan. 14, 2019). Nelson, K. 2014. Corn Yield Response to the Solar Corridor in Upstate Missouri. Agron. J. 106:1847–1852. https://dl.sciencesocieties.org/publications/aj/abstracts/106/5/1847 (accessed Jan. 14, 2019). US Department of Agriculture-National Agricultural Statistics Service. 2019. Quick stats. USDA-National Agricultural Statistics Service, Washington, DC. http://quickstats.nass.usda.gov/ (accessed Jan. 8, 2019).